Do you like inexpensive books? Do you like a really, really wide selection of inexpensive books? Really? You do? So do I!!!! 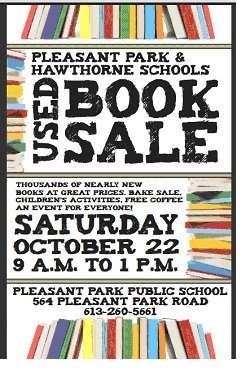 That’s why I’m going to the giant, humongous used book sale at Pleasant Park School this Saturday! Doors open at 9 am. It’s family friendly and a great way to spend an October Saturday morning! Proceeds go directly back into Pleasant Park and Hawthorne Schools so the few bucks that you put down will be spent on children in our communities. Tell your neighbours! Tell your friends! I’ll be there helping out so make sure you look for the bald guy with the goatee and say hi!